The main reason I'm reviewing the Acer C710-2457 Chromebook is because it's cheap. It costs $230 from Acer's Web site, and a close cousin of this model that's available only at Walmart costs a mere $199. Unfortunately, bargain pricing continues to be the main reason to consider a Chromebook. Vendors want to tempt Web-centric consumers away from their tablets and smartphones with the promise of a decent-size screen and a bona fide keyboard. Most of the current Chromebooks are so basic, however, that they're can't offer the better experience that would help their case. 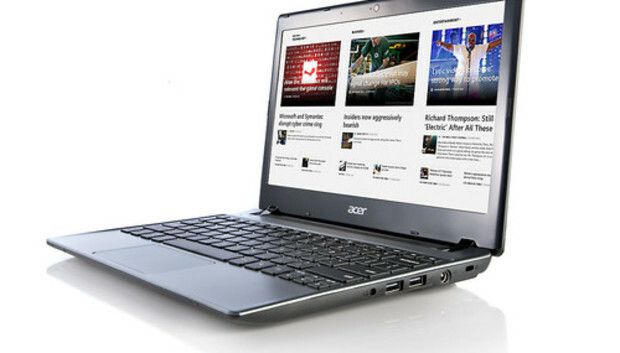 The Acer C710-2457 Chromebook is yet another example. All it provides is a bargain browsing machine that could knock around the family room or a kid's backpack without causing parental trauma. The unit is made entirely of hard plastics, with a thick, shiny black bezel around the display and a lightly textured keyboard and touchpad. It feels pretty sturdy, with just a touch of flex in its keyboard and display panels. It measures 11.2 inches wide by 8.0 inches deep and 1.1 inches thick, and it weighs 3.04 pounds. It uses a 1.1GHz Intel Celeron 847 dual-core processor with 4GB of DDR3 memory and a 16GB solid-state drive. You get ethernet and IEEE 802.11a/b/g/n Wi-Fi, a trio of USB 2.0 ports, and an SD/MMC port for media cards. Acer says the 4-cell, 2500mAh Li-ion battery lasts 3.5 hours, but it ran for just 3 hours in our tests. The 11.6-inch TFT LCD display has native resolution of 1366 x 768 pixels. It looks nice when you view it straight on, but the image degrades if you tilt it much in any direction. Brightness is decent (200 nits, per Acer's spec), and color was nice--I actually liked the healthy pink of its flesh tones. VGA and HDMI ports are available for display output. Videos played pretty well on the Acer Chromebook, but the sound from the dual speakers was awful: very tinny, with no bass and little volume range. Plugging in headphones improves the experience. The full-size keyboard is adequate. Travel is short, and the island-style buttons are a little small, but the keys are widely spaced so you don't feel cramped. The large, clickable touchpad supports two-finger scrolling. The hard feel of the plastic keys is one of the main reasons this machine feels cheap, but the key arrangement also has its drawbacks. The top row of function keys are half-size. The page-up, page-down, and cursor keys are even smaller and are squished into the lower right corner. The right- and lefthand Chrome Search buttons (with magnifying-glass icons) on either side of the spacebar will likely be hit by mistake when one tries to press the <Alt>, <Fn>, or <Ctrl> keys on the same line. There's nothing wrong with the Acer C710-2457 Chromebook, other than its being as unremarkable as nearly every other Chromebook now available. Low prices don't seem to be the answer, given that HP's Pavilion Chromebook, which sports a 14-inch display, is a strong seller even though it costs about $100 more. Maybe if a few more vendors stuck their necks out to improve the user experience, they'd find more willing buyers.